Doña Elena Al Dente and the benefits of pasta - All Chucked Up! For a better understanding of the difference of Bronze and Teflon Die Cut pasta, watch the short video below. Aha! Learned something new, eh? 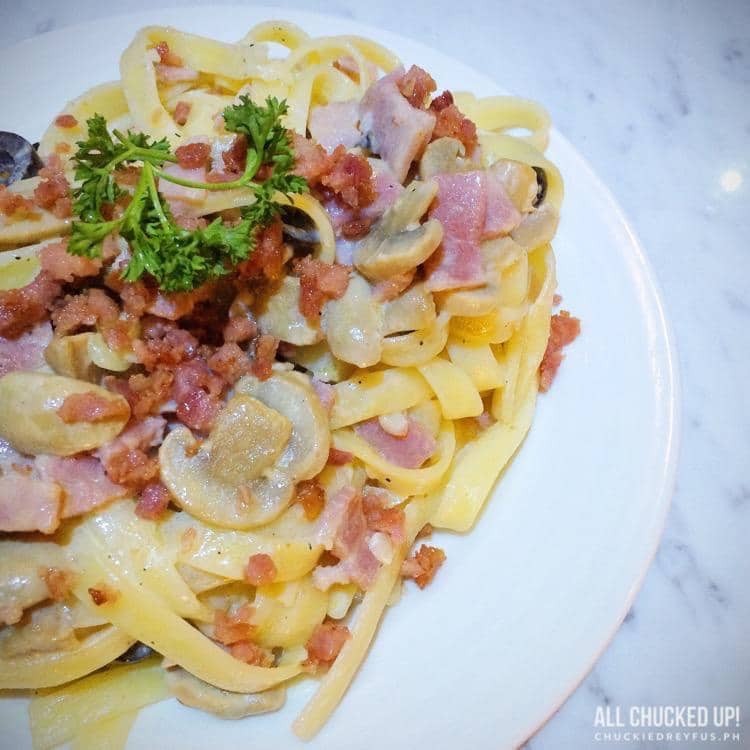 I’ve been a lover of pasta ever since I was a kid. 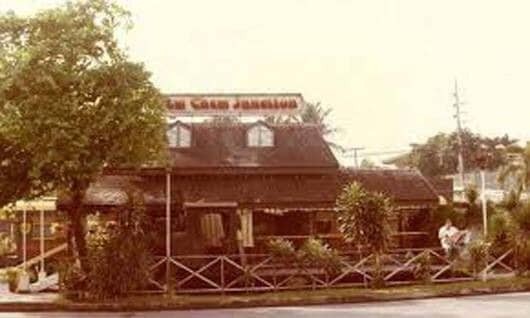 Even back in the days when my dad would take me to the old “Chew Chew Junction” spaghetti house (train) in Greenhills during the early ’80s. Hahaha… how’s that for a throwback? 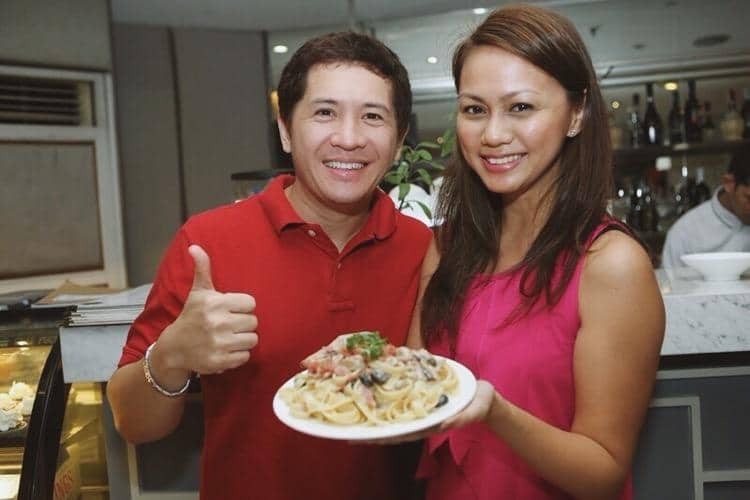 I’ve fallen in love with pasta also because it greatly helped me drop my weight during my rigorous 6-month fitness and diet regimen wherein I lost 50lbs (185-135lbs). Pasta was my main source of carbohydrates. Why? Because unlike rice, pasta is a complex carb. Your body doesn’t break it down just as easily as white rice or white bread. It provides a way for the body to absorb glucose slowly. As you very well know, if glucose (commonly know as “sugar”) is absorbed faster, your body has more fuel that it actually needs to burn. What happens to the excess starch? It becomes stored energy in the form of (you guessed it! )… FAT. Apart from that, pasta keeps me feeling full longer which is great especially for weight watchers! I have tons to be thankful for because of pasta. 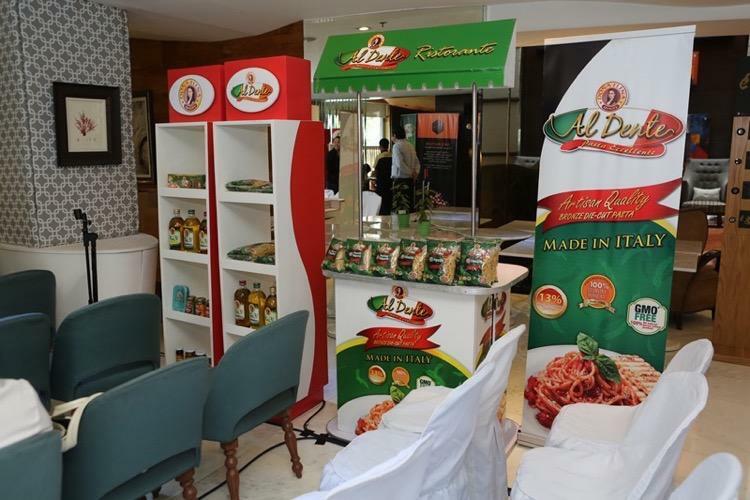 That’s why when they held their launch event in time with National Pasta Day (October 25) and National Pasta Month (October), I immediately attended with my wife. I fully supported Doña Elena Al Dente’s activities because I truly believed in the product. 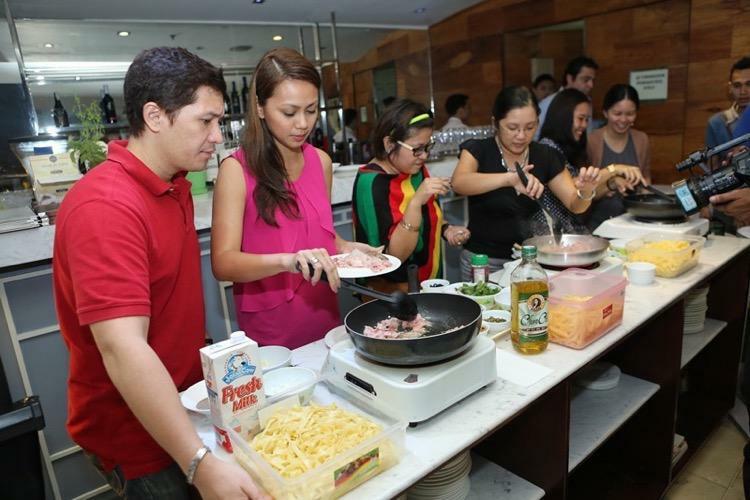 During the event, I witnessed Chef Davide Lombardi prepare different kinds of pasta dishes using Doña Elena Al Dente which my wife and I were intently watching. 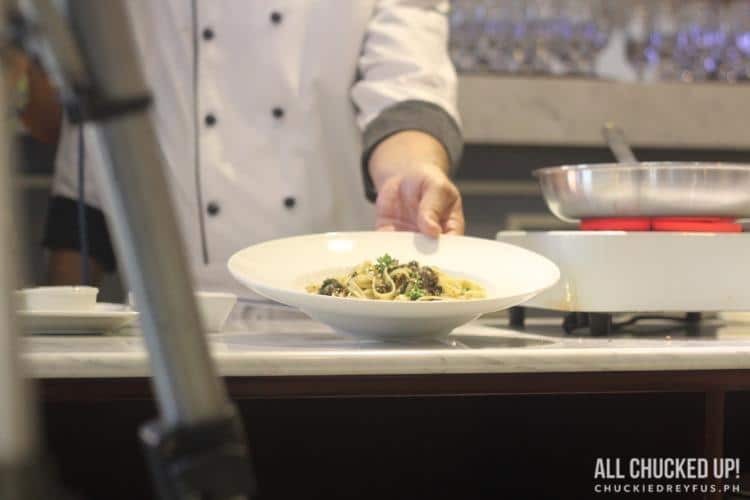 Chef Lombardi whipped up 2 pasta creations during the program, one of which was the Fettuccine alla Siciliana using Doña Elena Al Dente Fettucine. Then, during a brief presentation, I eventually learned that not all pasta are created equal… Teflon and Bronze Die Cut, remember? Oh! And there was a Doña Elena Al Dente cooking contest, too! Thank God my wife was with me during the event. 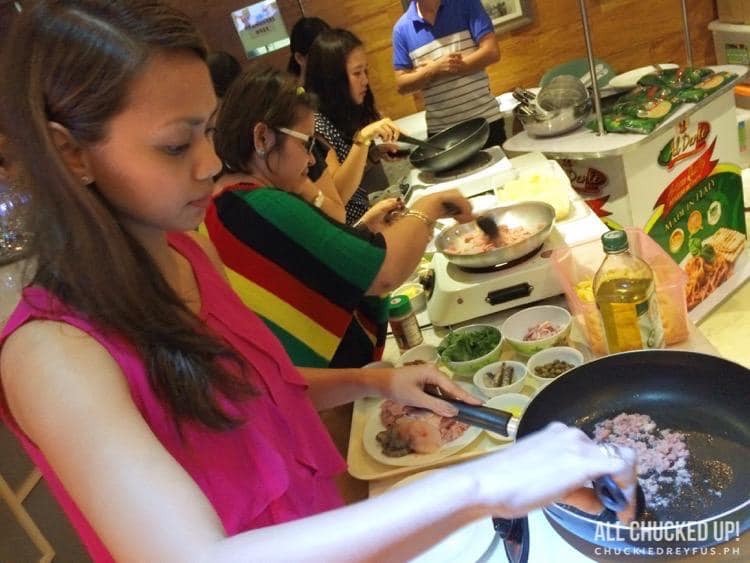 It was a quick 10-minute contest wherein 3 pairs were to face-off in a friendly cooking competition. Ready to start our friendly cooking competition. Each pair had a dish to cook depending on what we were to randomly pick from a fishbowl. My wife and I got the cream-based recipe. It was all about my wife from here on out. I offered my whole-hearted moral support and simply watched on. Hahaha! Here was our finished product… tada! To make the long story short, we all came up with our own dishes and my wife and I were able to bag 2nd place! Not bad given the circumstances. Yeah! 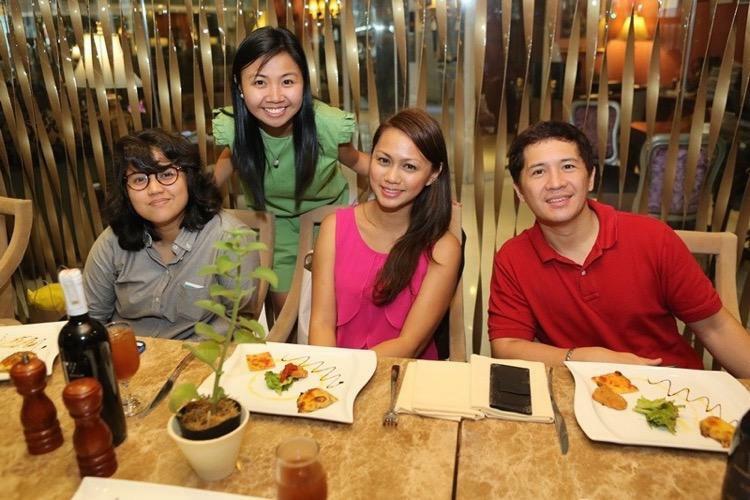 Guests were treated to a wondeful meal at Lucia Ristorante after the brief program. Always great food at Lucia Ristorante in Hotel Celeste. 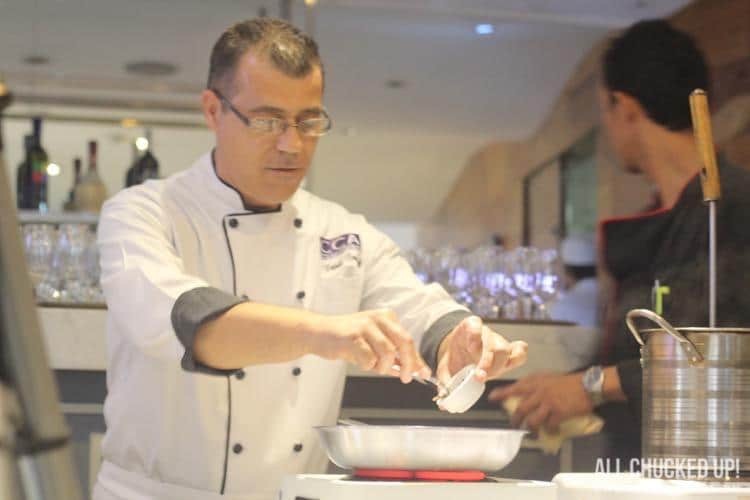 This particular dining experience showcased Chef Lombardi’s amazing pasta dishes using Doña Elena Al Dente. Absolutely delizioso, if I may say so myself! 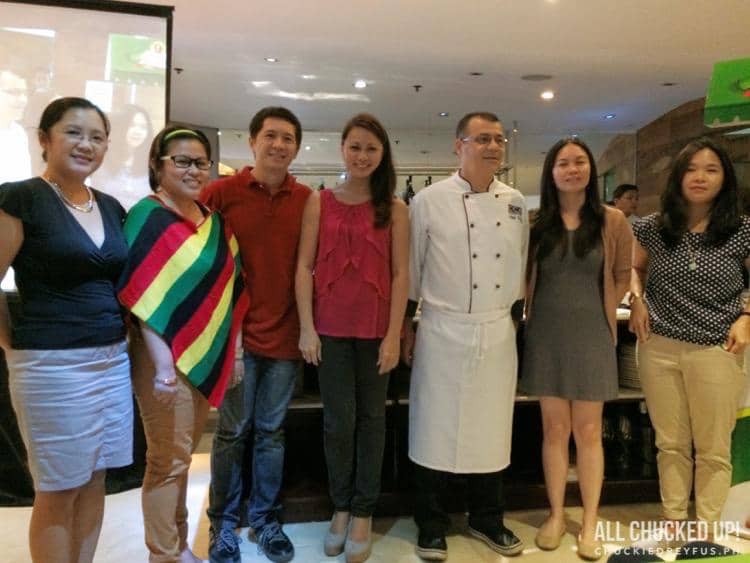 During our meal, Ms. Nina Daza-Puyat, who hails from a family of renowned chefs and restaurateurs, shared a few of her fond memories of family, cooking experiences and life abroad. 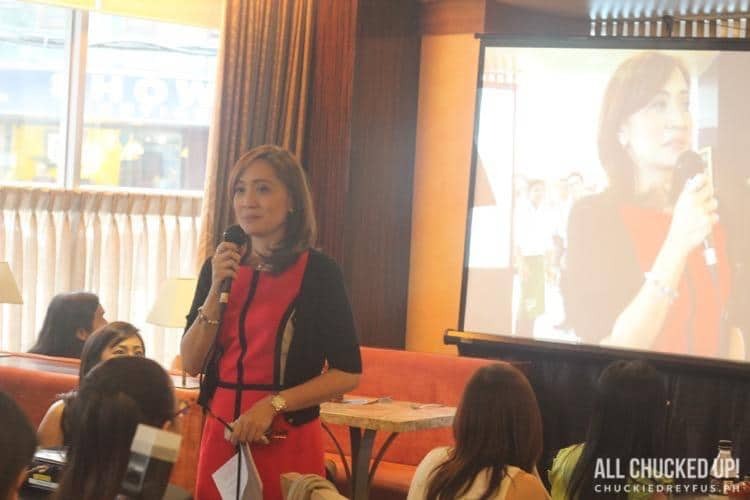 During her short talk, she mentioned the significance and benefits of pasta as well. All in all, it was an afternoon well spent. Thank you Doña Elena Al Dente for inviting us to an amazing (and very entertaining) launch. I owe a lot of my weight loss success to pasta and being part of National Pasta Day and celebrating National Pasta Month with you guys was the least I could do. I cannot say it enough… not all pasta are created equal. 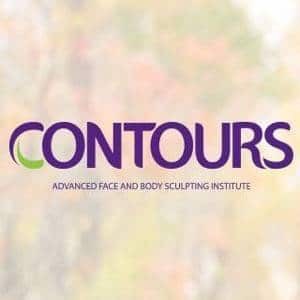 Make sure that you are getting your hard-earned money’s worth and that your body is truly benefiting from it. 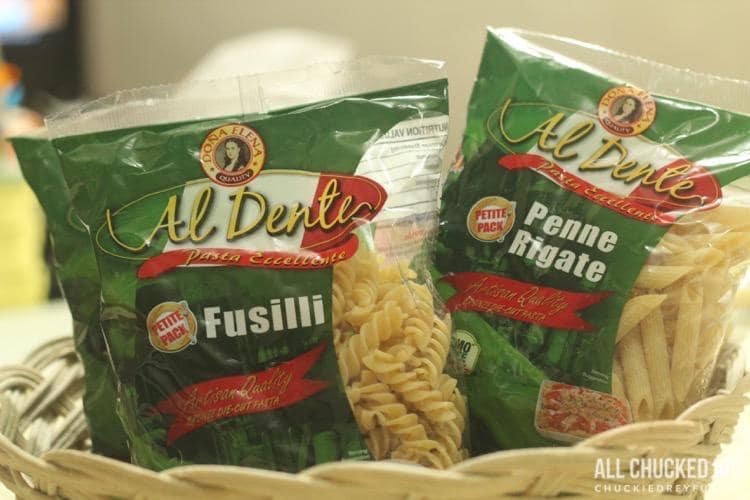 Doña Elena Al Dente Pasta is the only artisan quality Italian Pasta in the country, using high quality 100% Durum Wheat semolina or hard wheat. It is 100% certified all-natural and GMO-free… just the way I like my pasta. So, during your next meal, why not try going for pasta instead of the usual staples of rice and white bread. Your body will thank you for it. Remember, dieting isn’t just about cutting down on food intake. It’s more about knowing WHAT to eat. 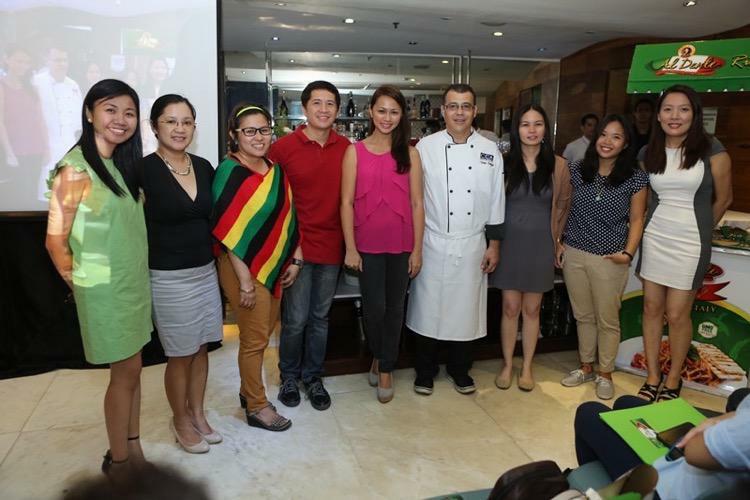 To know more about Doña Elena and their other amazing and healthy products, check out their official website. Here’s to healthier choices! Here’s to Doña Elena Al Dente! Happy National Pasta Month, everyone! ‹ Globe iPhone 6 and iPhone 6 Plus starts November 14! › Avengers Infinity War Teaser! OMG!